We are honored to have Gustavo’s music and talents in our game. The texture of Gustavo’s musical score serves the game’s narrative and the music is rife with poignant, descriptive and intimate sounds. His work is unlike anything heard in a video game before. It’s a beautiful, haunting, sonic landscape that makes the game’s themes more emotionally resonant and emphasizes thoughtfully how Joel, Ellie, and all the characters in the game perceive the world around them. It’s a masterful musical score. Want a sampling of the sonic delight Gustavo crafted for The Last of Us? Visit the Sony Music Soundtracks SoundCloud set. If you pre-order the game, via the Sights & Sounds DLC pack, you’ll get full access to the official digital soundtrack. The soundtrack is also available for purchase as a CD via the Sony Masterworks label. The Last of Us arrives June 14th, 2013. Bah, why does the soundtrack have to be $7 more in Canada? Messi, Maradona, the Pope & Santaolalla. Argentinian proud. Yes! All great players are their own kind of sport. Stop torchering me Naughty Dog The Last Of Us looks so awesome. We will be talking about MP very soon! He’s really amazing. The soundtrack from “Babel” is just superb! He’s an incredible talent and a remarkable musician and artist. 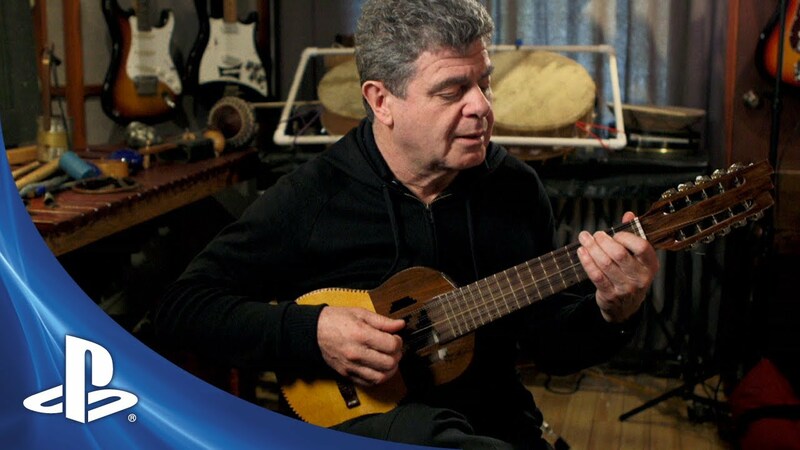 Gustavo Santaolalla is a legend! Will you sell The Last of Us shirts like the ones the editors of Ign wear? Digital Version Of The Last Of Us Playable During Download !!!! Naughty Dog has told Game Informer that its upcoming survival horror epic The Last of Us will be released digitally through the PlayStation Store on June 14, the same day that the game releases in stores on Blu-ray disc. There’s also something special about this simultaneous release. Naughty Dog’s creative director Neil Druckmann and The Last of Us game director Bruce Straley told Game Informer that Sony has worked a little magic so that you won’t have much of a delay before playing the digital version. The game will be playable once the download hits 50 percent. Sony has promised that, on PlayStation 4, downloadable games will be almost instantly playable while the download carries on in the background. So much respect for this project, love the theme song of this game, definitely gonna be iconic. How about Joel & Ellie for PlayStation All-Stars Battle Royale? I’m super bummed out that you guys allowed the ending to the game to get leaked. I found out through a message on my PSN with the title giving it away. You guys should fire that guy who labeled the hacked file that. …My most anticipated game this year (unless MetalGearSolid V comes out this year-your in good company :D). Gosh, this video was awesome. Gustavo’s music sounds amazing, and seems like the perfect emotional fit for this game….. Gah!!! It feels like such an awesome time to be a gamer!!! Gustavo is the man! His work is truly outstanding and masterful. Nonetheless, I’m stoked for The Last of Us! MISSING THE COMPLETE SOUNDTRACK ,THE 48 HOUR MP XP BOOSTER ,PS3 DYNAMIC THEME AND THE PSN AVATAR !!!!!!!! can someone give me the good code from my collector ????? Is it going to be Day 1 Digital?